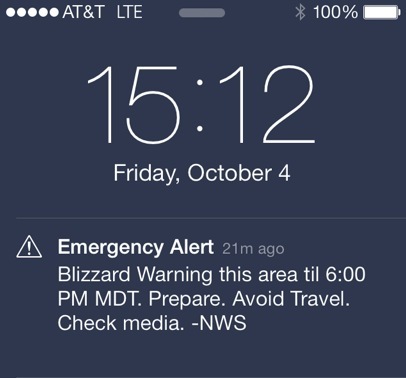 How I missed the news that this blizzard was on its way I have no idea. For the last couple of days before leaving Boulder, I glanced at forecasts, and nothing looked like it was going to get this bad. I obviously didn't look too closely. The freakiest thing was when a shrill emergency tone broke through on the speakers at full volume. Just like the signal on TV when it tells you that this is just a test. It was a message on cell phone that seemed to be tailor-made for my brand of imbecility, listing the three precautions I had not taken. Roo was lobbying for a stop, but this is south Wyoming - sparse country. On top of that the visibility got so bad that I had to feel my way over to the side of the freeway. Roo, of course, thought every stop was so that we could get out into the snow. Luckily, a sign saying 'Chugwater' appeared. Whatever was off that ramp, we were taking it. Fortunately there was a motel, where we've been stuck since this afternoon. Well, one of us is stuck. The other one feels like a young blonde ski bunny who's been taken on a trip to the Swiss Alps. This video isn't edited. Just a postcard from Wyoming.